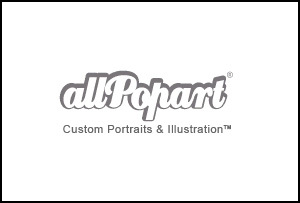 allPopart.com® is brought to you by a group of artists and professionals with a great passion for art, decoration and design. Since we started in 2003, we have served thousands of happy customers all over the world, while avoiding the price and hassle that custom services and products usually entail. All of our customized pop art portraits are professionally created by our award-winning team of illustrators, design artists and professional framers. We hand illustrate all of our designs with digital equipment but we never use artificial or pre-made software filters in our work.